Many of the pulse generator manufactured by Kentech are suitable for driving pockels cells. Pockels cells are used for many applications mainly within laser systems. bear in mind the following points when considering a system. 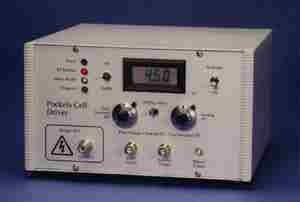 Longitudinally driven cells offer the highest performance but require the highest voltages. Transverse driven cells require less drive voltage but exhibit poorer thermal stability and lower extinction ratio. The voltage required is proportional to the wavelength. Half wave switching requires twice the voltage of quarter wave switching. Double crystal cells require half the voltage of single crystal cells but have more surfaces and more crystal material and consequently are less preferred inside laser cavities. The price of a driver scales like the peak power (voltage squared), the repetition rate and the reciprocal of the risetime. Avalanche drivers offer fast rise times but cannot easily support long pulses into resistive loads. The risetime of a cell / driver combination will depend upon the cell capacitance and the effective charging resistor but allowance must also be made of the transit time of the drive pulse across the crystal, or the time it takes to fill the crystal with the electric field. It is not possible to have very fast large aperture devices even if the capacitance is kept small. Through terminated systems tend to be faster but require more pulser power. However, if the pulse fidelity s not significantly reduced by a cell the pulse may be used again in a second cell. This can offer improved extinction ratio without the cost of a second driver. 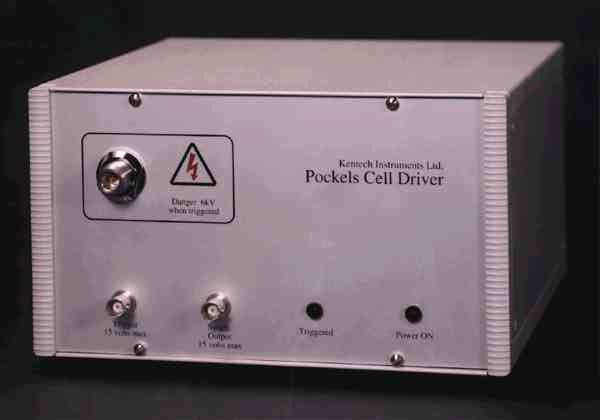 Drivers generally cost considerably more than pockels cells. "Q" switches are used to open / close a laser cavity to allow /stop lasing. Although there are a variety of methods, pockels cells are often used. The cell will change the state of polarisation of the laser light and when combined with a polariser will permit the opening or closing of a cavity or cavity dumping or filling. If the cell is double passed before the light reaches an analyser then quaterwave switching may be used. This cannot be as fast as the light must pass the cell twice. In many cases it is adequate and can offer lower voltage drive (and hence be considerably cheaper) than a singly passed half wave system. In many cases it is only necessary to close the cavity to permit lasing to build up. In these cases the driver can simply switch a high voltage to ground (or some other level). Only one edge of the pulse is important. More complex arrangements may be necessary for regenerative amplifiers where the laser has to be seeded, possibly from a mode locked train (so pulse picking may be needed). After amplification the cavity has to be dumped, either with the same cell or a second cell. The regenerative build up time may be up to a microsecond or more and low jitter delays of this duration are needed for reproducible operation. Some crystals used for pockels cell have significant peizzo electric effects. When the voltage accross such a crystal is changed quickly, strain can be induced in the material. Often the strain will produce bifringence within the cell that counteracts the bifringence being induced by the pockels effect. In pulsed systems this effect is simply overcome by increasing the amplitude of the applied pulse to greater than that required for DC induced retardation. However, in simpler systems that just apply a voltage and then remove it, the fast removal can result in strain and the cell may not return to its quiescent state for some time, related to acoustic time scales. To overcome this some Q switch drivers offer the possibility to switch beyond ground, i.e. charge to some voltage V and then switch down to -ΔV. By chopping a laser pulse as it builds up inside a "Q" switched cavity it is possible to produce a "Q" switched output pulse considerably shorter than the normal "Q" switched pulse. This is an alternative to cavity dumping in which the pulse length is determined by the cavity round trip time. With Intra-cavity chopping the pulse length is set by the difference of cavity round trip time and the length of the gate pulse applied to a pockels cell in the cavity. Effectively the cell is used to dump some length of the pulse before full amplifiaction has occured. The results in a narrower pulse without the inefficiency of extra-cavity chopping. This work has been published by Charlton & Ewart (Opt. Comm. 50,4, p241, 1984). We can build suitable pulsers for this type of work. With a pair of polarisers around a pockels cell the laser light may be chopped very quickly with a fast high voltage driver. This can produce chopped pulses down to around 100ps (please enquire about possible methods to go faster). Extra cavity pulse chopping is not nearly as efficient as intra-cavity pulse shaping or pulse compression by, for example, Brillouin back scatter. However, it is a very simple technique and is easily adjustable. Kentech has built systems suitable for use at 1μm, that can gate from around 100ps to 12ns under remote control. Pulse picking is the selecting of a pulse from a mode locked train. Typical pulses in mode locked trains are 7 to 12 ns apart depending upon the length of the mode locked cavity in use. Consequently in order to pick out a single pulse an extra cavity system can be used with a pulse that goes from zero to the half wave voltage and back to zero in the two round trip times of the cavity. The peak voltage should be timed to the pulse. Although pulses in mode locked trains are typically sub 100ps the gate used for pulse picking is generally nearer the two round trip times. This means that slowly varying drive pulses can be used and that changes in timing will not greatly affect the transmission of the pulse picker. Occasionally pulse clean up may be required also and a shorter gate may be necessary to remove unwanted optical pulses in the train that occur between the main pulses. If a short gate drive is used the timing becomes more critical and it will be necessary to synchronise the driver to the RF drive to the cavity as well as to the peak of the mode locked train (for a "Q" switched mode locked system). Kentech can supply suitable trigger circuits for this purpose. This requirement is normally required to stop the build up of Amplified Stimulated Emmision. It would use a system like a pulse picker or extra cavity chopper. Generally timing is less critical. If the pulse propagating through the system depletes the gain in the amplifiers it is only necessary to reduce transmission before the pulse. Obviously the gate drive pulse must be flat for a time at least as long as the propagated optical pulse. The use of a three electrode cell allows complete decopupling of a pair of drivers without increasing the number of optical surfaces. Separate drivers allow the generation of fast edges for both turn on and turn off of the cell. Many laser systems are now required to produce shaped pulses or to use shaped drive pulses in order to extract efficiently as much as the energy as is possible from the amplifiers. Kentech can make pulse systems that produce arbitrary waveforms that an be applied to a pockels cell (or cells) in order to control the transmission. Typical systems use many small pulsers, the outputs of which are added with a programmable timing and possibly programmable amplitude. In this way an arbitrary waveform may be built up. In some cases it may be necessary to use a clean up system after the pulse, depending upon the application and requirements.